Khaya ivorensis (KI) represents one of the mostly used medicinal/pesticidal plants in Nigeria. While investigations into its chemical compositions and biological activity have been severally reported, little is known about the elementology, fastness and fungicidal performance of KI parts on wood. 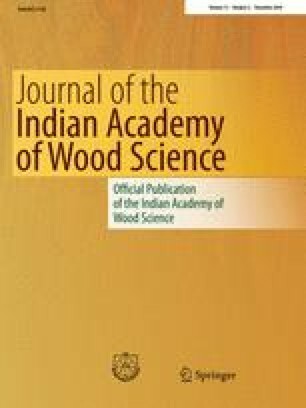 This study determined the elementology of some wood-preservative chemical elements [aluminium (Al), arsenic (As), boron (B), cadmium (Cd), chloride (Cl−), chromium (Cr), copper (Cu), mercury (Hg), iodine (I), lead (Pb), silicon (Si) and zinc (Zn)] from KI stem bark (KISB). Extracts colour fastness and fungicidal performance on woods were also examined. Cl− was severally folded highest (2137.50 ± 8.29 mg/kg) followed by Zn (50.13 ± 0.04 mg/kg), Si (32.50 ± 2.50 mg/kg), and the lowest were Cd and Hg (0.00 ± 0.00 mg/kg). The extracts from KISB showed good hand-rubbing reddish-brown colour fastness on two non-durable white woods. The two fungi Ganoderma lucidum (white rot) and Sclerotium rolfsii (brown rot) caused similar decay trend on both woods (Triplochiton scleroxylon and Vitex doniana) with lowest concentration (5%) showing best fungicidal performance of 11.9% wood weight loss (WWL) compared to control (43.1% WWL). The fungicidal best performance of KISB at 5% concentration considered the treated wood samples as “resistant” according to the description of ASTM D (2017), implying KISB is effective. It may be inferred that the fungicidal performance of the KISB could be attributed at least in part to its contents of chloride, zinc, silicon and chromium. This article was part of project funded by the International Tropical Timber Organization (ITTO) under Grant No. 009/12S awarded to the first author. The authors, therefore, thank ITTO for financial support. The authors also thank Dr. Eguakun F. S. of the Department of Forestry and Wildlife Management, University of Port Harcourt, Nigeria, for statistical advice. GAA designed the experiment, performed the experiment and drafted the manuscript. OYO supervised the work. AAA and ATO were responsible for elementology study and proofread the drafted manuscript. AAA provided financial support. All authors fully contributed and approved the final manuscript.